Working with Dean Kamen on his water distillation system was a life changing event. Inspired leadership, talented team, complex system - elegant, efficient, game changing. My first contribution, based on renegotiating the system energy budget, led to a redesign that reduced the overall weight by 45%. 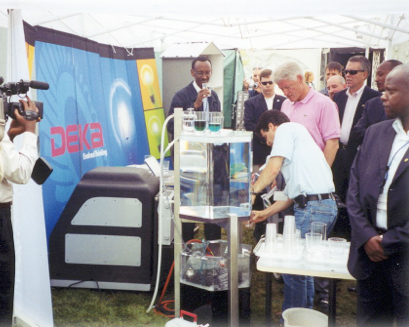 It was an honor to serve President Clinton a glass of water from our prototype. (Full disclosure: the secret service didn’t let him drink, so he faked it for us.) A quick Prezi on my work with the DEKA water system available here.